so that we went a step further and coded up the gap statistic to find the proper k for k-means clustering. In combination with the clustering algorithm, the gap statistic allows to estimate the best value for k among those in a given range. If the target distribution is disjointedly clustered and only one instantiation of Lloyd’s algorithm is used, the danger exists that the local minimum reached is not the optimal solution. The initialization problem for the k-means algorithm is an important practical one, and has been discussed extensively. It is desirable to augment the standard k-means clustering procedure with a robust initialization mechanism that guarantees convergence to the optimal solution. The interested reader can find a review of the k-means++ algorithm at normaldeviate, a survey of implementations in several languages at rosettacode and a ready-to-use solution in pandas by Jack Maney in github. To initalize the board with n data points normally distributed around k centers, we call kmeans = KMeans(k, N=n). The snippet above creates a board with 200 points around 3 clusters. The call to the find_centers() function runs the standard k-means algorithm initializing the centroids to 3 random points. Finally, the function plot_board() produces a plot of the data points as clustered by the algorithm, with the centroids marked as stars. In the image below we can see the results of running the algorithm twice. Due to the random initialization of the standard k-means, the correct solution is found some of the times (right panel) whereas in some cases a suboptimal end point is reached instead (left panel). Let us now implement the k-means++ algorithm in its own class, which inherits from the class Kmeans defined above. Let us explore what the function init_centers() is actually doing: to begin with, a random point is chosen as first center from the X data points as random.sample(self.X, 1). Then, the successive centers are picked, stopping when we have K=5 of them. The procedure to choose the next most suitable center is coded up in the _choose_next_center() function. As we described above, the next center is drawn from a distribution given by the normalized distance vector . To implement such a probability distribution, we compute the cumulative probabilities for choosing each of the N points in X. These cumulative probabilities are partitions in the interval [0,1] with length equal to the probability of the corresponding point being chosen as a center, as explained in this stackoverflow thread. Therefore, by picking a random value and finding the point corresponding to the segment of the partition where that value falls, we are effectively choosing a point drawn according to the desired probability distribution. 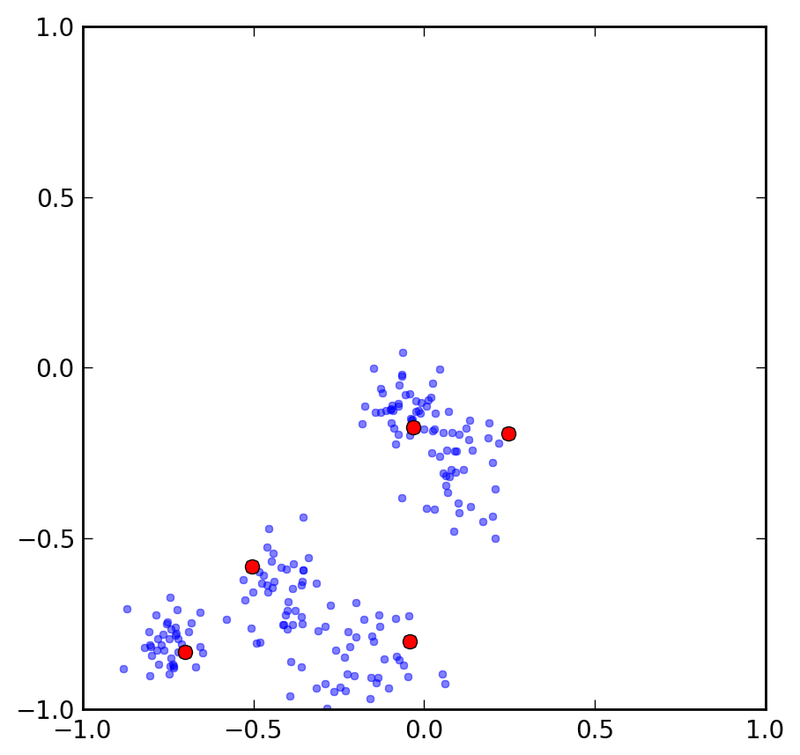 On the right is a plot showing the results of the algorithm for 200 points and 5 clusters. 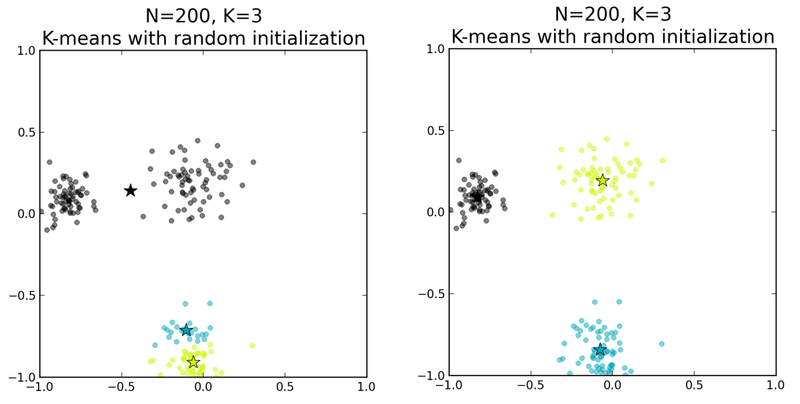 The standard algorithm with random initialization in a particular instantiation (left panel) fails at identifying the 5 optimal centroids for the clustering, whereas the k-means++ initialization (right panel) succeeds in doing so. By picking up a specific and not random set of centroids to initiate the clustering process, the k-means++ algorithm also reaches convergence faster, guaranteed by the theorems proved in the Arthur and Vassilvitskii article. The k-means++ method for finding a proper seeding for the choice of initial centroids yields considerable improvement over the standard Lloyd’s implementation of the k-means algorithm. The initial selection in k-means++ takes extra time and involves choosing centers in a successive order and drawing them from a particular probability distribution that has to be recomputed at each step. However, by doing so, the k-means part of the algorithm converges very quickly after this seeding and thus the whole procedure actually runs in a shorter computation time. 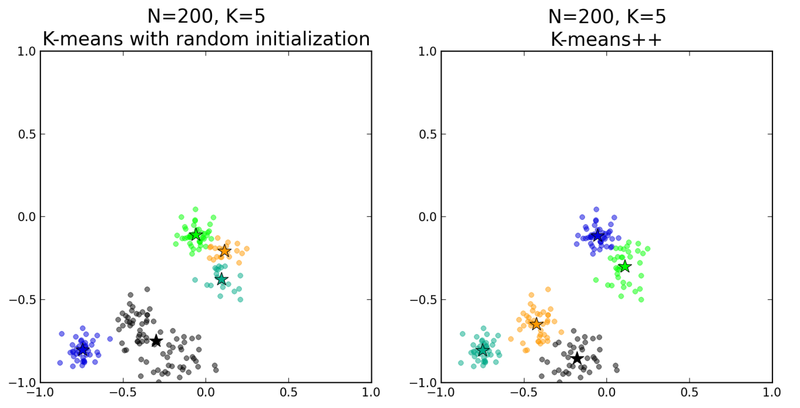 The combination of the k-means++ initialization stage with the standard Lloyd’s algorithm, together with additional various techniques to find out an optimal value for the ideal number of clusters, poses a robust way to solve the complete problem of clustering data points. Thanks for the comment, you’re totally right! As this post follows up on the previous ones in the clustering series, I didn’t include the imports again in the code shown here. Thanks for noticing! when I run the instruction! This picks two sets of (guaranteed distinct) points as your initial values for the cluster centers. I think your implementation of the K-means++ algorithm is inefficient for large values of k, because it involves O(k^2) calculations but need only involve O(k). I found this also to be the case in the Matlab Statistical toolbox version of the code. The key is in the step where you compute the distance between each point in X and the nearest centre already chosen. The point is that you don’t need to recalculate the distances for each centre already chosen, because you have already worked that out on the previous step. So you only need an array of distances of the length of X and then compute the distance of each X to the SINGLE new centre you have chosen, and if that is less than the existing minimum for X then replace it in the array. When I implemented this in Matlab (about 6 lines of code!) it made a dramatic speed up – around a factor 100 when I was using a large number of centres. It probably makes it easier to understand the algorithm from a tutorial point of view, but it doesn’t scale well with increasing k.
Thanks for this thoughtful comment! Indeed the code is not written for speed or optimised in any way. As you mention, it was written in the spirit of a tutorial but not intended for production. Your suggested fixes would absolutely speed up the performance and I’m glad you pointed them out. You should use ‘probability’ and not ‘cumulative probability’ as the distribution, or else cluster quality is unchanged from random seeding. What does the “” do in “ind = np.where(self.cumprobs >= r)”? I do not use numpy, and I am trying to code this algorithm in pure Python. The code does not work. k-means++ clearly is a major improvement over k-means with random initialization. There are however quite general problems where k-means++ fails to get anywhere close to the optimum if k is larger than a problem-dependent value. I illustrate this in a recent report (https://arxiv.org/abs/1706.09059) and also propose a method which often can improve the results of k-means++ by a large margin (several percent SSE). Python software (jupyter notebooks) is available as well: https://github.com/gittar/k-means-u-star. feedback/criticism very welcome!